Cost of sales increased by 33% for the period to $1.44 million (2018: $1.08 million), while for the quarter a 3% increase was observed to $504,892 (2017: $490,974). As a result, gross profit grew year-on-year for the nine months period by 37%, to $4.08 million compared to $2.98 million reported as at February 2018. Gross profit for the third quarter closed at $1.46 million (2018: $1.32 million). Total expenses increased by 29% for the period under review to $3.52 million (2018: $2.74 million). This increase was associated with a 34% uptick in administrative expense to $3.11 million compared to $2.32 million reported in the previous comparable period. Notably, this was offset by a 15% reduction in promotional expenses which closed at $48,580 from $57,023 reported in February 2018. Depreciation and amortization expense closed the nine months period at $171,120 (2018: $169,991). For the quarter, total expenses closed at $1.29 million (2018: $1.31 million). Consequently, operating profit within the nine months grew by 42% to $564,067 (2018: $397,409). Operating profit for the third quarter totalled $166,750 versus $163,664 reported in the prior corresponding period. 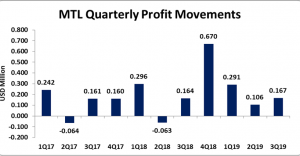 Profit for the nine months amounted to $563,731 (2018: $397,234), while for the quarter MTL’s profit closed at $166,750 relative to $163,547 in the previous comparable quarter. The nine-months earnings per share was $0.0084 compared to $0.0059, while the EPS for the quarter amounted to $0.0025 compared to $0.0024 for the corresponding quarter of 2018. The twelve months earnings per share amounted to $0.018. The number of shares used in our calculations was 67,500,000. MTL closed the trading period on April 10, 2019 at US$0.25. The Company, as at February 28, 2019, recorded total assets of $5.31 million versus $5.56 million in 2018, a 4% decline. This was due to a 46% decline in ‘Trade and Other Receivables’ and a 16% decline in ‘Development Costs’ which closed at $79,657 (2018: $148,250) and $87,851 (2018: $104,931), respectively. Total Shareholders’ Equity as at February 2019 closed at $4.34 million (2018: $4.12 million), which resulted in a book value of $0.064 (2018: $0.061).